Wentworth Property Company, LLC (“WPC”), an Arizona-based development and acquisition company, has expanded their business focus adding a self-storage facility division. Dave R. King joined WPC as vice president of the self-storage division. Mr. King has over 10 years of multi-faceted experience in the self-storage industry. WPC’s first two self-storage facilities are Pima Thomas in Scottsdale, AZ and Plaza Storage in Las Vegas. “We are very excited about adding self-storage facilities to our portfolio and Dave’s expertise and knowledge of this industry has been instrumental in our ability to secure these first two properties,” said James R. Wentworth, managing principal of WPC. Located on 4.3-acres on the northwest corner of Thomas and Pima Roads, Pima Thomas is an adaptive reuse development project. 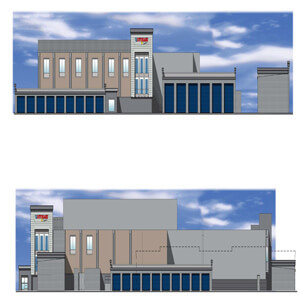 WPC is redeveloping a long-vacant, former semi-conductor facility into a ±120,000 square foot state-of-the-art self-storage facility with ±87,000 square feet of air conditioned indoor storage and ±33,000 square feet of exterior, drive-up storage which will include some oversized storage units for recreational vehicles (RV), boats and warehousing purposes. When completed the four-story self-storage facility will include over 950 units ranging in size from 5’x5’ indoor units to 15’x40’ drive-up units. Pima Thomas will offer elevator access to all four levels and an innovative security, monitoring and access system. The property, located one block west of the Loop 101 with a full-diamond interchange at Thomas Road, will have two retail PADS along Thomas Road available for future development. WPC expects to complete the redevelopment of Pima Thomas during the second quarter of 2016. Plaza Storage is an existing 67,000 square foot property on a well-traveled and visible section of East Tropicana Avenue in Las Vegas. The facility offers both air-cooled and drive-up units to accommodate a variety of tenants. WPC purchased the property and plans to invest capital in the property to update it to today’s standards and bring in a top-tier management company to more effectively operate Plaza Storage.